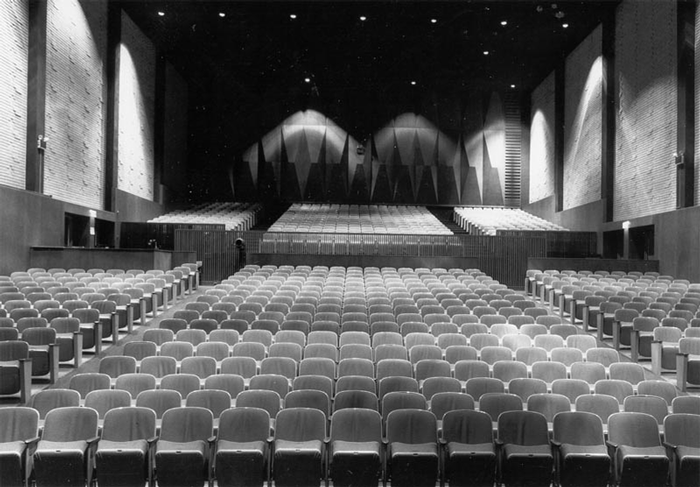 The beautiful Jewett Auditorium is the home for most Caldwell Fine Arts Performances. It is located on the College of Idaho Campus in Caldwell, Idaho. We also host activities in Langroise Center, next door to Jewett Auditorium. How much is parking? Where can I park? Parking is free (yes, really!). Enter our main parking lot at the corner of Fillmore and 20th. Additional parking is available along 20th, or in the Activities Center parking lot at Indiana and Oak. As the new library is being built, parking in the Jewett lot may be tight. Please leave extra time to park. Handicap parking is available in all parking lots. Please call 459-5783 or 454-1376 for any special needs. Don’t want to drive? We are excited this year to offer transportation to our events for those 60 and over. No fares are charged, but riders may give a voluntary contribution. A van will come right to your door and return you safely home after the concert. Wheelchairs can be accommodated. Please call Tosha at (208) 459-0063 at least three days prior to the concert. 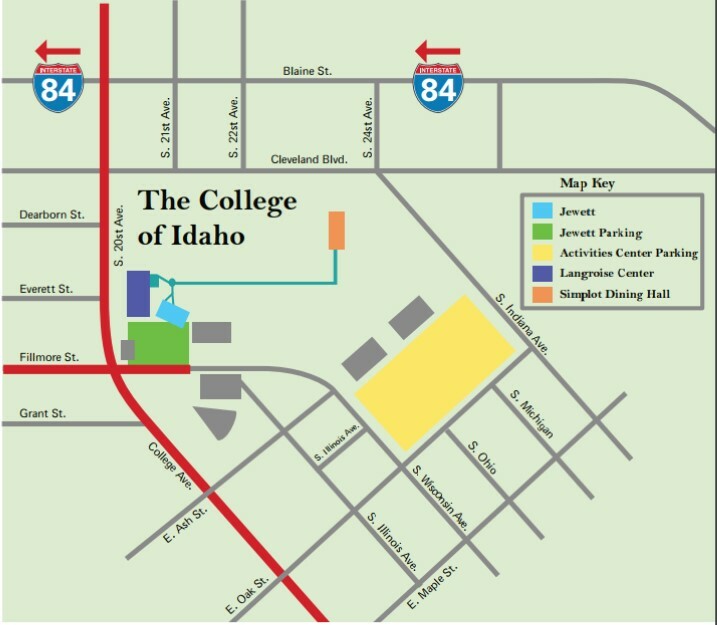 Click here for a map to College of Idaho. Most of our patrons will tell you that there isn’t a bad seat in Jewett Auditorium. It’s true! Our remarkable acoustics make every seat a magnificent surround-sound experience. There are no beams or other visual barriers to worry about. Some people prefer to sit in the A section to be closer to the action, while others prefer the balcony in sections B or C.
For piano concerts, many people prefer to sit on the left side of the auditorium to see those flying fingers. For families with young children, we recommend aisle seating. Yes! We love young people at performances, and strive to maintain a family-friendly line-up of events in our season. We consider every event to be appropriate for all ages. Most children will be enthralled by our performances and with some coaching beforehand can be very successful concert-goers. We do not have an age requirement, but do encourage parents to carefully consider their child’s temperament as they make decisions about bringing them to events. We suggest that you select an aisle seat in case your child grows restless, and wait in the lobby with them until you can return during applause between numbers. Please be courteous of other concert-goers and make sure children’s behavior does not distract from anyone else’s enjoyment. Some families choose to bring a small notebook and crayons for younger children in case they become fidgety. Most events have an intermission for bathroom breaks and snacks. We do not charge for babes-in-arms, but again ask for your consideration of other concert-goers. You will want to arrive about 15 minutes early if you already have your tickets. If you need to purchase tickets, make a change, or have any special needs, please arrive at least 30 minutes prior to showtime. If you arrive late, you will be asked to wait until applause between numbers to be seated. For popular or sold-out performances, we reserve the right to seat others in your seat if you have not arrived 10 minutes after showtime. What time do ticket sales begin before a performance? We begin selling tickets one hour before the performance begins. You may make online reservations up until one hour before the performance. After that time, please come to the Ticket Table. Can I bring my cell phone or other electronic devices and play games, text, or shine annoying lights around the auditorium? No. Just No. Please turn off all electronic devices before the performance begins without reminders. All performances are reserved seating. We encourage purchasing your tickets ahead of time over the phone or online, so you can avoid waiting in the ticket line the night of the performance. What ticketing fees do you have? We charge $.55 for each online ticket to help defray our costs. At the door, there is also a $.55 fee for credit card orders. There are no fees for cash or check purchases at the door. There is a $2.00 mail-order fee for both phone orders and online sales if you want paper tickets delivered through the mail. We have prices in three seating levels for Adults and Children/Students to fit a variety of budgets. Any child under the age of 18, or a college student with an ID card can purchase a Child/Student ticket. Current College of Idaho students receive free entrance into events. The Student Programs Board has prepaid these tickets through Student Activity Fees. We frequently offer other discounts for online ticket sales on our Facebook page or through our email list. Make sure to sign up and get the discounts! • Like us on Facebook here. • Sign up for our mailing list using the form at the base of the website. If you have a group who would like to come to a performance, we offer great discounts based on the size of your group. We offer multiple performances at a discount when purchased for a group, such as a business. Call us at (208) 459-5783 or email info@caldwellfinearts.org for information. Our biggest discounts come by purchasing the Simple Season. Choose 5 different events before September 1 and receive 20% off your whole order! The discount is automatically applied. Just give us a call if you need help. We love to host business groups, scout troupes, charities, churches, and families! Give us a call to talk about group discounts. We can even recognize your organization at the performance. I'm having trouble printing my tickets! Help! Our print-at-home tickets come as PDF files you open through your confirmation email. The first step is to make sure you have Adobe Acrobat installed and up-to-date on your computer. Click here to download this free program: http://get.adobe.com/reader/?promoid=JZEFU. If you have Adobe and still can’t access your tickets, try printing your confirmation email. You can present that in place of your ticket at the door. You can also present your ticket on a smart phone or tablet. If all else fails, just come to the ticket counter 30 minutes before the performance and we’ll look up your account on the computer. I don't like to buy tickets online. What can I do? Just give us a call. We’d love to help you over the phone or in person. Caldwell Fine Arts presents and promotes the fine arts, educates the community, and develops cooperative relationships for the arts in the Treasure Valley. Caldwell Fine Arts (CFA) enriches the cultural life of Caldwell and the Treasure Valley. CFA presents music, dance, theater and visual arts in a variety of styles that reflect the diversity of the world. Caldwell Fine Arts exposes community students to the arts through age-appropriate programs held at Jewett Auditorium, in the schools, and in the community. What services do you offer those with disabilities? There is handicapped parking available. Jewett Auditorium is equipped with wheelchair and wheelchair companion seating. If you order tickets online, you will see the wheelchair designated seats. If you order over the phone, we can help you select an appropriate seat. There are no stairs required to enter the building. There is a ramp up to the auditorium. All A-level seats do not require any stair climbing. B- and C-level seats are in the balcony and require climbing stairs. We offer handicap-accessible restrooms. If you have any special needs, please don’t hesitate to call us at 459-5783 or 454-1376. We’ll do anything we can to help you have a wonderful experience with Caldwell Fine Arts. How do I receive information about Caldwell Fine Arts? Please sign up for our mailing list and select paper mail, email, or both. We mail once or twice a year through regular mail, and about every month with email. We’ll never sell or misuse your information. • Use the form at the base of the website. We also keep a lively Facebook page going where you can get the latest on upcoming events, pictures from past events, audition notices for Missoula Children’s Theater and the Nutcracker, and even a discount here and there. Make sure to “Like” us on Facebook so you don’t miss a thing! Click here to visit our Facebook page. Caldwell Fine Arts has stayed alive for over 50 years through ticket sales, donations, and grants. The costs related to bringing in the world’s best entertainment far exceeds ticket revenue. We depend on the generosity of the individuals and organizations that are committed to keeping live performance in our community. Please see our Season Sponsors on our webpage. Click on the logos and visit these organizations. Business Sponsorships are always welcomed. Contact us at 459-5783 or info@caldwellfinearts.org if you’d like more information on business opportunities. Where did you get that pretty website? Josh Olswanger and the team at Thrive Web Designs did it. We’re glad you like it!